Okay, I think I definitely have a problem. In around March last year, I bought Penny Serenade (1941) for $1.50 at the Warehouse (see, that bargain hunting is a huge skill I have in life), and I've waited until now to watch this movie. I do admit though I watched part of it just after I bought it. So it's not all that bad, is it? It was weird seeing Cary Grant and Irene Dunne in a tragic weepie, considering the last film I saw them together in was the very funny screwball comedy 'The Awful Truth'. It is also amazing that Cary Grant's performance in this was one of only two Oscar nominations he received in his entire career. Come on, the guy was one of the greatest actors ever, and he never won an Oscar!! Grant plays Roger, who marries Julie (Dunne), and when they go to Japan, Julie discovers she is about to have a baby. But an earthquake shatters all hope of her ever having a child of her own. The couple try adoption, but holding on to the child they have fallen for with no income is a hard road to go down. Towards the end, the film gets quite sad, but confusing when you are required to read a hand-written letter which is almost impossible to read. I'm sorry, Irene Dunne, your writing was beautiful but a bit un-readable. 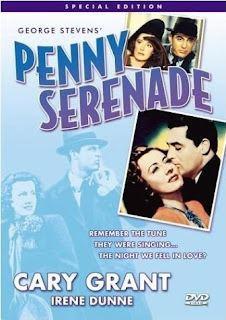 The title 'Penny Serenade' was a bit random, considering what the film is about, but music plays a big part throughout the film. George Stevens directs this black-and-white drama, and it is a valuable credit to his filmography, which includes Giant, Woman of the Year and Swing Time. This film is great for people who like stories about children, but not for children. And especially those who like Cary Grant.